Amanda Erwin is a registered and licensed Master’s level Occupational Therapist. Amanda graduated with a Bachelor’s of Science in Community Health from Florida Gulf Coast University (FGCU). She continued her education at Florida Gulf Coast University and obtained her Master’s of Science in Occupational Therapy. During her time at FGCU, Amanda was involved with her sorority and volunteering with the Special Olympics. Amanda is a member of the American Occupational Therapy Association and was involved with the Florida Occupational Therapy Association. Amanda completed her fieldwork experience here at Building Blocks Pediatrics which ignited a passion for working with the pediatric population and she is thrilled to be part of the BBP Occupational Therapy team. 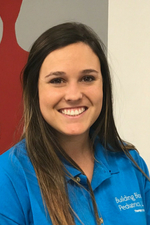 Amanda incorporates evidence based practice and occupational therapy theories to guide her in helping children reach their highest level of potential. In her free time, she loves being outdoors and going on hikes and bike rides with friends. Amanda enjoys traveling to new places and meeting new people. She is looking forward to exploring her new home in Atlanta.